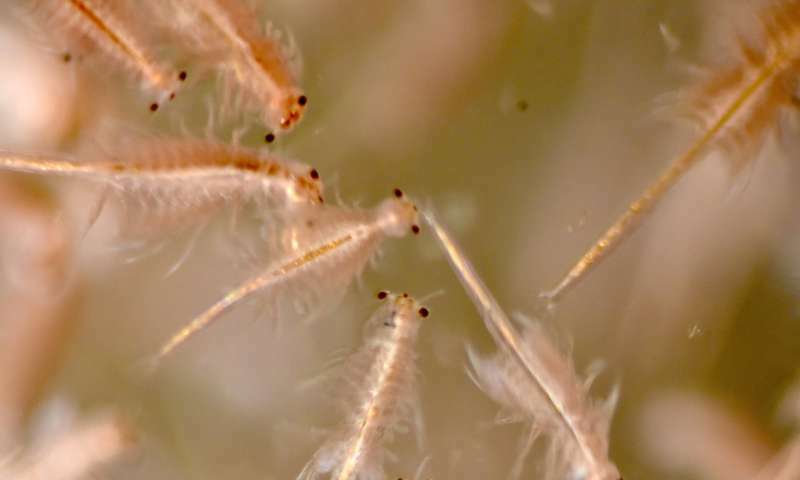 Image of a brine shrimp (Artemia salina) swimming through water with variable density due to a vertical gradient in salinity. Differences in light refraction through the density gradients creates corresponding gradients in image brightness. Credit: Isabel Houghton, image obtained with the assistance and facilities of R. Strickler (UWM). 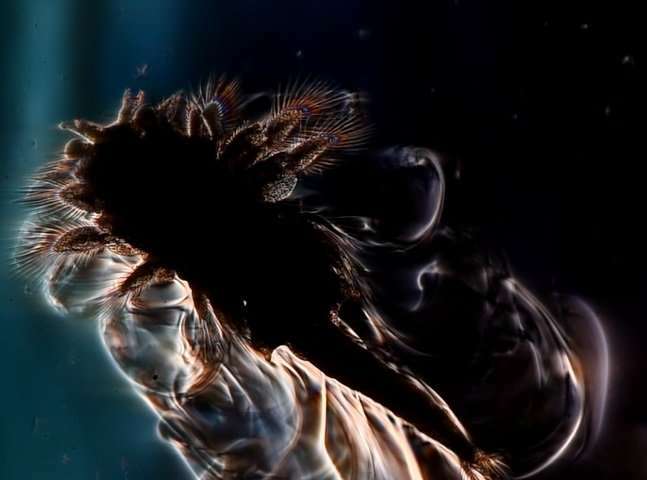 Although the work was carried out in the lab, the finding is the first to show that migrating zooplankton – or indeed any organism – can create turbulence at a scale large enough to mix the ocean's waters. The work could alter the way ocean scientists think about global nutrient cycles like carbon, phosphate and oxygen, or even ocean currents themselves. "Ocean dynamics are directly connected to global climate through interactions with the atmosphere," said John Dabiri, a professor of civil and environmental engineering and of mechanical engineering. "The fact that swimming animals could play a significant role in ocean mixing – an idea that has been almost heretical in oceanography – could therefore have consequences far beyond the immediate waters where the animals reside." "Right now a lot of our ocean climate models don't include the effect of animals or if they do it's as passive participants in the process," Dabiri said. One of the most common zooplankton, krill are among the most abundant marine organisms and migrate daily in giant swarms, heading hundreds of meters deep by day and up to the ocean's surface by night to feed. Dabiri and graduate student Isabel Houghton tried to answer that question not in the ocean but in the relatively controlled environment of large water tanks in the lab. The pair worked with Jeffrey Koseff and Stephen Monismith, professors of civil and environmental engineering who are experts on mixing in the ocean, to create flow environments that mimic the ocean with saltier water on the bottom of the tank and less salty water on the top. The resulting gradient mirrors ocean conditions that any organism would need to disrupt in order to cycle nutrients between the ocean's surface and water deep below. "There's no appreciable deep mixing of oxygen or carbon dioxide in the ocean if you can't overcome the stabilizing influence of salinity and temperature gradients," Koseff said. With cameras closely recording the animals' movements, the group has been able to measure the individual water eddies surrounding each brine shrimp and the larger currents in the tank. From these, they've shown that turbulence from individual organisms aggregates into a much larger turbulent jet in the wake of the migration. What's more, those flows were powerful enough to mix the tank's salt gradient. "They weren't just displacing fluid that then returned to its original location," Houghton said. "Everything mixed irreversibly." Before this work, scientists had thought that krill and other zooplankton could only create turbulence in their own size range – on the order of centimeters. That's hardly enough to move nutrients on a meaningful scale. Now it appears that zooplankton have the capacity to mix ocean waters, at least regionally. Furthermore, Dabiri said their findings might not just apply to organisms like krill in the upper kilometer of the ocean, but also to jellyfish, squid, fish and mammals that swim even deeper, potentially churning the entire water column. Despite the work's potential impact in how ocean scientists think about the role of marine animals on global issues like climate and nutrient cycles, this research has a storied past. Its funding was once featured in a list of government waste known as The Wastebook, which referred to it as studying synchronized swimming in sea monkeys. "By starting simple and using an unorthodox organism like the brine shrimp, it has allowed us to now go into the ocean and measure something where we have a more specific target in mind," Dabiri said. More information: Vertically migrating swimmers generate aggregation-scale eddies in a stratified column, Nature (2018).